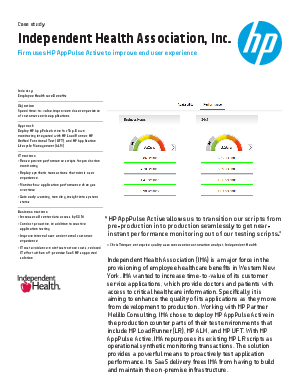 > HP AppPulse Mobile > Independent Health Association, Inc. Independent Health Association (IHA) is a major force in the provisioning of employee healthcare benefits in Western New York. IHA wanted to increase time-to-value of its customer service applications, which provide doctors and patients with access to critical healthcare information. Specifically, it is aiming to enhance the quality of its applications as they move from development to production.